The year 2019 in Germany is dedicated to the celebration of the centennial of the Bauhaus movement. In particular, Weimar, Dessau, and Berlin will hold a series of events in connection with this anniversary. The city of Tel Aviv-Jaffa will also be represented in these events on account of its center’s unique fabric founded on the architectural style adhered to by the Bauhaus school. 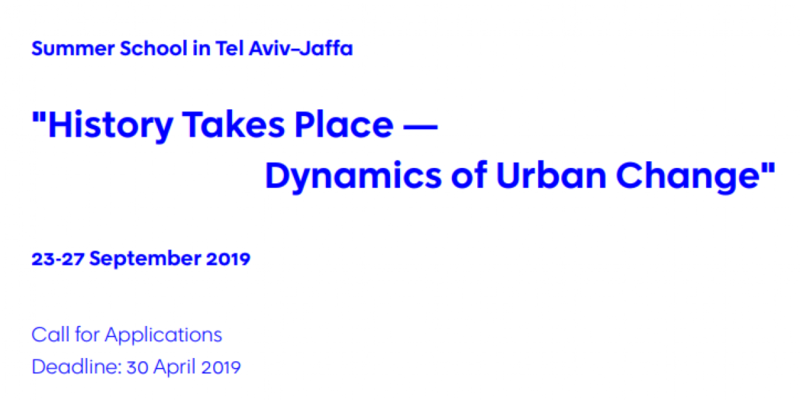 In the same vein, the ZEIT-Stiftung Ebelin und Gerd Bucerius and the Gerda Henkel Foundation will hold from 23rd until 27th of September 2019 the interdisciplinary program “History Takes Place – Dynamics of Urban Change“ in Tel Aviv-Jaffa focusing on its Bauhaus heritage. Founded as a suburb of Jaffa, Tel Aviv has evolved by the mid-1930s to become the most prominent city of the Jewish citizenry of Palestine under the British Mandate and that due to an influx of immigrants coming mostly from Eastern and Central Europe in search of a safe haven from anti-semitic policies. Graduates of the Bauhaus and similar schools in Europe have supplied the demand for housing and urban development in the rapidly developing city. Jaffa, remaining the leading city of the Arab citizenry, also boasted the international style of that time, but to a lesser extent, it was less conspicuous against the backdrop of the previously built environment. Since 2003 the ZEIT-Stiftung Ebelin und Gerd Bucerius has invited young scholars to take part in studies programs in various locations. The Gerda Henkel Foundation is the program partner since 2009. This year, in cooperation with the White City Center (WCC), it will focus on the concept of ‘Societies on the Move’; i.e. the movement of people, materials, and cultures as a central element of modern architecture and this element’s influence on the urban landscape. The Summer School wishes to explore historical and contemporary relationships through representations of identities, examining how migration and mobility affect individuals, cities, and cultures while reshaping their identities. In the past years the summer school “History Takes Place“ has taken place in Belgrade and Sarajevo (2017), Rome (2014), Istanbul (2013), Paris (2010), Warsaw (2009), Lviv (2007), Wrocław (2005) and St. Petersburg (2003). The summer school invites applications particularly from postgraduate students in history, art history, cultural studies, and the social sciences, as well as young architects and urban planners. Applicants should have a genuine interest in an interdisciplinary exchange on the history of the city and city development. Participants should have a specialization associated with Tel Aviv-Jaffa, Israel and the Middle East as well as a keen thematic and methodological interest in urban studies. Sessions will be held in English. Applicants are expected to prepare for the sessions with course materials and reading lists in order to be able to give a presentation on a set topic related to their academic interests and competencies.